46 y.o. 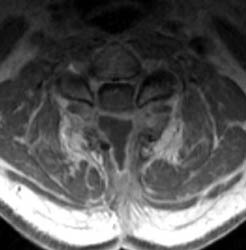 male, initial complaint of progressed with myelopathy, difficulty walking, and imbalance. 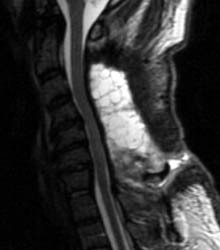 Underwent laminectomy C3 to C7, 2 months prior to these images. 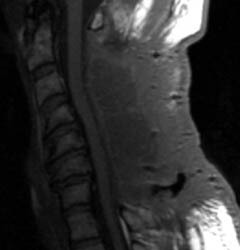 Worsening numbness and weakness brought patient to seek neurosurgical consultation again, prompting repeat imaging. 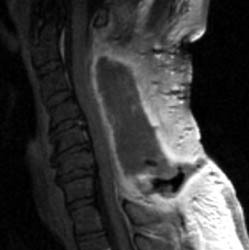 Sagittal T1 pre (A) and post contrast (B), sagittal T2 (C) and Axial T1 post contrast (D) MRI images of the cervical spine demonstrating a large posterior fluid collection with an obvious sinus tract inferiorly and associated gas bubbles. This was proved to be a post-operative seroma and epidural scar (note the thick rind of enhancement) that was partially accounting for this patient's residual and worsening symptoms despite the initial decompressive surgery.